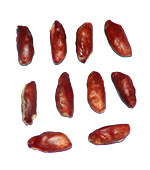 Rudraksha seed are extracted from the High quality Rudraksha nut shell to improvised the technique of fast growing of Rudraksha plant.This seeds have the germinating capacity of 99% within three month period of time. This seed require high care during plantation and the procedure will be mailed along with the rudraksha seed that you have order. The packet contain 10 number of seeds which is able to give ten Rudraksha plant after sprouting.